New Zealand High Commissioner W. J. Jordan, second from left, greets airmen from the Royal New Zealand Air Force who have arrived in Britain to serve with the Royal Air Force. They were armourers and wireless operators who worked on ground duty. 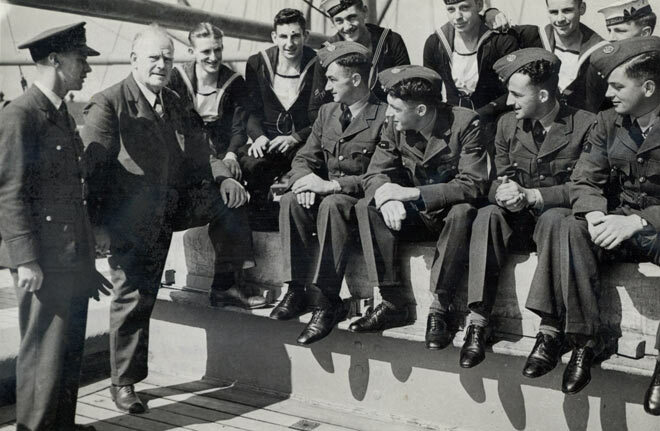 Also on the ship, sitting behind the airmen, are some New Zealand naval reservists, 7,000 of whom served in various branches of Britain's Royal Navy.